While settling into a new career in a new community, Ivy is determined not to let the holiday season pass her by. Casey Ellis is the last person who should be planning her office’s holiday party. Juliette Mabry is a happily married stay-at-home wife and mother...until there appears to be trouble brewing in her nearly ten-year marriage. Romantic comedy junkie Natalie lives out those fantasies in real life three New Year's Eves in a row when fate throws her together with the same handsome stranger. A heartbreaking turn of events leaves her swearing off of love, forevers, and the holidays (bah humbug). I was excited about this short story collection which came out just in time for Christmas! It helped put me in the spirit of the season and I was hoping for some cheerful tales of hope - I wasn’t disappointed in the least! All three authors captured a sense of the season and brought in characters that were modern and relatable. 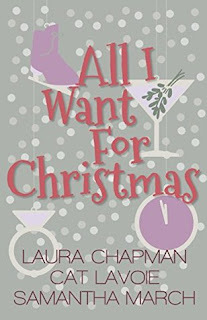 Making Christmas (Laura Chapman) probably gave me the most inspiration, one can sometimes get bogged down by the organisational aspect of the holidays and it was refreshing to relive the delight children feel through the eyes of adults. I really found it charming and I’ve never encountered the concept before done quite in this way. Nine Ladies Dancing (Cat Lavoie) felt the most realistic to me I loved Casey’s fear of screwing everything up and the novella was funny with heart and a great twist of fate that always makes me smile. I loved her attitude to keep on persevering despite always feeling she was on the edge of catastrophe. The Christmas Surprise (Samantha March) was written from Juliette’s perspective and I related immediately to her internal dialogue. She hovered between perfectly balanced and off the wall thoughts which made me smile despite the things she was worried about- I also really liked her relationships with her son, her husband and her best friend. All of the novellas were strong short stories and I found each one instantly relatable and the characters were all in depth and natural. These tales of the holiday spirit will definitely make you smile!